Background and aims Liver resection (LR) and transplantation are the most reliable treatments for hepatocellular carcinoma (HCC). Aim was to compare different guidelines regarding indication for resection and transplantation because of HCC with and without underlying cirrhosis. Methods We compared the following guidelines published after 1 January 2010: American (American Association for the Study of Liver Diseases (AASLD)), Spanish (Sociedad Espanola de Oncologia Medica (SEOM)), European (European Association for the study of liver-European Organization for Research and Treatment of Cancer (EASL-EORTC) and European Society for Medical Oncology-European Society of Digestive Oncology (ESMO-ESDO)), Asian (Asian Pacific Association for the Study of Liver (APASL)), Japanese (Japan Society of Hepatology (JSH)), Italian (Associazione Italiana Oncologia Medica (AIOM)) and German (S3) guidelines. Results All guidelines recommend resection as therapy of choice in healthy liver. Guidelines based on the Barcelona Clinic Liver Cancer staging system recommend resection for single HCC<2 cm and Child-Pugh A cirrhosis and for HCC≤5 cm with normal bilirubin and portal pressure, whereas transplantation is recommended for multiple tumours between Milan criteria and for single tumours ≤5 cm and advanced liver dysfunction. Patients with HCC and Child-Pugh C cirrhosis are not candidates for transplantation. JSH guidelines recommend LR for patients with Child-Pugh A/B with HCC without tumour size restriction; APASL guidelines in general exclude patients with Child-Pugh A from transplantation. In patients with Child-Pugh B, transplantation is the second-line therapy, if resection is not possible for patients within Milan criteria. German and Italian guidelines recommend transplantation for all patients within Milan criteria. Conclusions Whereas resection is the standard therapy of HCC in healthy liver, a standard regarding the indication for LR and transplantation for HCC in cirrhotic liver does not exist, although nearly all guidelines claim to be evidence based. Surprisingly, despite European guidelines, Germany and Italy use their own national guidelines which partially differ from the European. Possible solutions of the problems are discussed. ▸ Surgery is the only curative option for hepatocellular carcinoma (HCC). Several guidelines exist that provide recommendations regarding indication for resection and transplantation. Although nearly all guidelines claim to be evidence-based, we only find consensus in regard to indication for liver resection and transplantation for HCC in healthy liver, but a standard for the treatment of HCC with underlying liver cirrhosis does not exist. Traditional guidelines are based on efficacy but not yet effectiveness data. Only when outcomes, conditions, patient characteristics and interventions are described transparently, it will be possible to discuss possible reasons for different guidelines in different countries. Traditional guidelines are based on efficacy but not yet effectiveness of data. Progress in the development of guidelines will be made when the reasons that explain the differences in the existing guidelines can be identified. Promising prognostic factors considering tumor biology as well as liver function tests should be included in future guidelines. Different guidelines exist for the same problem. By presenting similarities and differences between guidelines of different countries regarding the indication for LR, liver transplantation (LT) as well as the recommendations regarding expansion of the transplant criteria, bridging and downstaging therapies and living-donor LT (LDLT), aim of this work is to evaluate, interpret and present solutions for the accounted problems. To generate a standardised basis for the systematic literature research, uniform comparison criteria were established within the guideline group. Criteria for selection were: guidelines should be in English, German, Italian or Spanish and published after 1st January 2010 to ensure that outdated guidelines are excluded. The guidelines should be generated by expert groups of internationally recognised organisations and based on evidence-based publications. If evidence-based guidelines were not provided, we included consensus-based guidelines. Tumour classification can be based on the Barcelona Clinic Liver Cancer classification (BCLC) staging system,9 ,10 which links staging of HCC in cirrhosis with treatment modalities or not. We performed a systematic research with Ovid. We screened the database Medline, Cochrane and PubMed. Table 1 illustrates the results in English language. Our key words for the search were: “guidelines hepatocellular carcinoma” and “guidelines HCC”. On websites of medical institution we found additional results in their respective native language (table 2). We conducted our online search on 21 April 2016. Two authors (GM and MK) screened the results manually and independently, by looking at the title and the abstracts. If the inclusion criteria were met, the manuscript was analysed. The search on the database in English language retrieved following guidelines: American (American Association for the Study of Liver Diseases (AASLD)),3 Asian (Asian Pacific Association for the Study of Liver (APASL)),11 Hong Kong,12 Japanese (Japan Society of Hepatology (JSH)),13 ,14 European Association for the study of liver-European Organization for Research and Treatment of Cancer (EASL-EORTC)15 and ESMO-ESDO16 and Spanish (Sociedad Espanola de Oncologia Medica (SEOM)).17 The Spanish guidelines and the evidence-based Japanese guidelines are a synopsis. The entire version of the Spanish guidelines in original language is freely accessible only for members of the Spanish Society of Medical Oncology (http://www.seom.org). As we could not have access to the entire version, we included the synopsis in our analysis. The found article about the updated version of the evidence-based Japanese guidelines suggested in the introduction a link to the homepage of the Japanese Society of Hepatology, where the entire new guidelines version was freely accessible and in English (http://www.jsh.or.jp/English/). We excluded the consensus-based Japanese guidelines, as evidence-based guidelines were also found, as well as the Hong Kong consensus recommendations because of a rather small population and because of the inclusion of the APASL guidelines. The search with the medical institutions in table 2 found following regional guidelines: Italian18 and German19 in the original language and the full version of the evidence-based Japanese guidelines. These were all included. We finally included in our analysis a total of five international and three regional guidelines, which are listed in table 3. We compared the guidelines included in table 3 regarding the indications for LR and LT in patients with and without cirrhosis. Additionally, we analysed the recommendations regarding the expansion of the transplantation criteria beyond Milan, regarding bridging therapies of patients still on waiting list for transplantation as well as downstaging of patients initially beyond Milan criteria and finally regarding LDLT. In order to assess the treatment recommendations of different guidelines in a comparable way, we generated uniform comparison criteria. 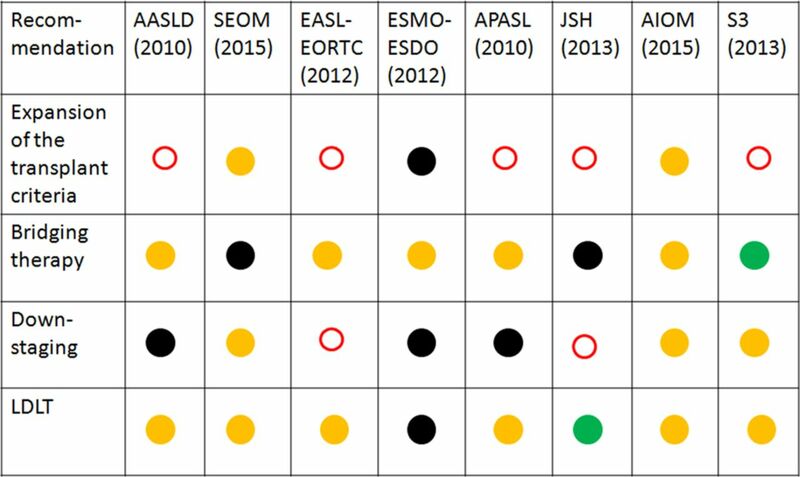 To present this comparison clearly, we chose a colour coding: in the event that no or no clear treatment recommendation was given, a black circle was assigned. Once a treatment option was recommended as first-line therapy, a green circle was assigned. A yellow circle was assigned when therapy can be carried out or when is recommended as second-line therapy. Rejection of a therapy was symbolised by a red-circled white dot. By this, we could summarise the mentioned treatment options and their associated recommendations very clearly in a tabular form. In all analysed guidelines, surgical resection is the treatment of choice for resectable HCC in absence of cirrhosis. In several guidelines, a more precise indication is given. According to the Spanish guidelines,17 LR is preferred in patients with early stage HCC who have no cirrhosis and an anticipated liver remnant of at least 20%.4 According to the ESMO-ESDO guidelines,16 resection is the recommended treatment in patients without advanced fibrosis, as long as an R0 resection can be carried out without causing postoperative liver failure due to a too small liver remnant.20 The German S3-guidelines19 define the criteria of non-resectability as follows: non-resectable extrahepatic tumour manifestation, patients’ general comorbidities, tumour infiltration in all three liver veins and a too small liver remnant.3 ,21 Also, re-resection in case of a recurrence appears to be feasible, as 5-year survival rates of up to 80% can be achieved as long as no extrahepatic tumour manifestation is found.22 Adequate postoperative liver function and portal hypertension need to be taken into account on functional resectability. In healthy liver, a minimum of 25–30% of liver parenchyma is needed to prevent risk of postoperative liver failure.19 Only the Italian18 and German S3-guidelines19 express a clear recommendation regarding LT for HCC in absence of cirrhosis. According to the Italian guidelines, a LT can be performed if surgical resection is not possible and no vascular and nodal invasion detectable. Moreover, LT should be offered to those patients who develop a local recurrence not suitable for resection at least 1 year after the primary resection. According to the German S3-guidelines, LT without cirrhosis should only be considered in the specific case of local recurrence of fibrolamellar carcinoma in absence of lymphonodal metastases.23 Figure 1 illustrates the comparison of the guidelines using the assigned colour codes as described in the methods section. Comparison of the guidelines regarding liver resection (LR) and liver transplantation (LT) for HCC in absence of cirrhosis. Green circle: first-line therapy. Yellow circle: therapy can be carried out or therapy recommended as second line. Black circle: no or no clear treatment recommendations. HCC, hepatocellular carcinoma. The American,3 the SEOM15 and the European guidelines EASL-EORTC and ESMO-ESDO13 ,14 base the therapy of HCC on the BCLC. For this reason, indication for resection and transplantation are mostly similar. The Asian,11 Italian18 and German19 guidelines base the treatment on the Child-Pugh Score. The Japanese evidence-based guidelines base the treatment algorithm on three major factors: liver function (Child-Pugh score), number and size of tumours. According to the AASLD guidelines,10 resection is the first-line therapy for patients who have a single lesion irrespective of the size and a still preserved liver function, normal bilirubin and hepatic vein pressure gradient <10 mm Hg. An increased bilirubin, a significant portal hypertension or minor fluid retention requiring diuretic therapy exclude resection also in case of Child A, and LT is indicated if the patient is within the Milan criteria (BCLC-A). In case of multinodular HCC within Milan criteria, LT is the first-line therapy. Resection is not indicated. For multinodular tumour outside the transplant criteria, neither resection nor transplantation is indicated. Similarly, according to the EASL-EORTC guidelines,15 resection is the first-line therapy option for patients with solitary tumours and well-preserved liver function, defined as normal bilirubin with either hepatic venous pressure gradient <10 mm Hg or platelet count ≥100 000. LT is the first treatment choice for patients with small multinodular tumours meeting Milan criteria (≤3 nodules ≤3 cm) or those with single tumours ≤5 cm and advanced liver dysfunction. In case of recurrence, the patient is reassessed with BCLC and treated accordingly. LR is the first-line curative treatment of solitary or multifocal HCC confined to the liver, anatomically resectable and with satisfactory liver function reserve according to the APASL guidelines.11 Definite contraindications for resection are distant metastasis, main portal vein thrombosis and inferior vena cava thrombosis. In case of non-resectable HCC within Milan criteria in Child A cirrhosis, local ablation is recommended. According to the evidence-based Japanese guidelines, LR is indicated for HCC if there are three or fewer tumours and all are limited to the liver. There is no restriction on tumour size.8 ,26 It is suggested that patients with tumour invasion to the portal vein be indicated for surgery if the tumour has not progressed beyond the first-order branches. In fact, portal vein invasion is consistently reported as the most powerful prognostic factor for HCC.27–29 No transplantation is indicated at this stage of cirrhosis. Figure 2 shows the comparison of the indications to LR and LT using the assigned colour codes as described in the methods section. Treatment of HCC in Child-Pugh A cirrhosis. Green circle: first-line therapy. Yellow circle: therapy can be carried out or therapy recommended as second line. Black circle: no or no clear treatment recommendations. Red-circled white dot: rejection of the therapy. HCC, hepatocellular carcinoma. According to the BCLC-based guidelines and JSH guidelines, the treatment recommendations for HCC on Child-Pugh B cirrhosis are identical to Child-Pugh A cirrhosis as described in the previous chapter. LR is the first-line curative treatment of solitary or multifocal HCC confined to the liver, anatomically resectable and with satisfactory liver function reserve according to the APASL guidelines.11 LT can be offered to patients within the Milan criteria when resection is not possible. Figure 3 shows the comparison of the indications for LR and LT. Treatment of HCC in Child-Pugh B cirrhosis. Green circle: first-line therapy. Yellow circle: therapy can be carried out or therapy recommended as second line. Black circle: no or no clear treatment recommendations. Red-circled white dot: rejection of the therapy. HCC, hepatocellular carcinoma. According to AASLD,3 SEOM17 and EASL-EORTC15 guidelines, Child-Pugh C score defines an end-stage disease. Neither transplantation nor resection is recommended. 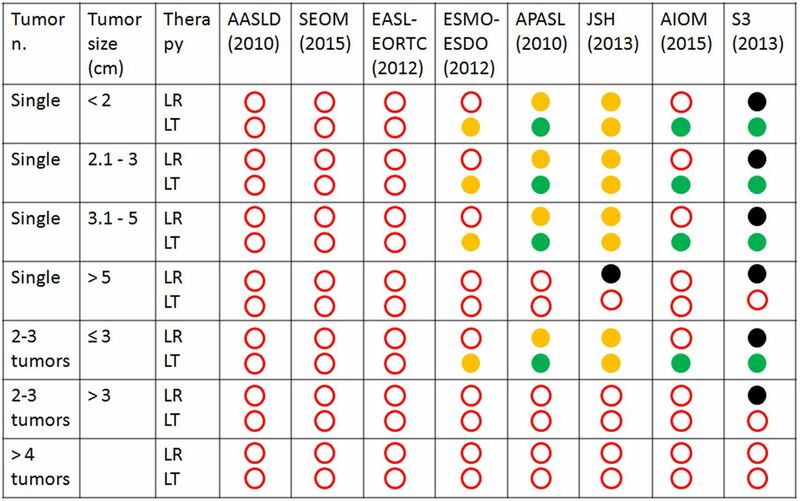 According to the ESMO-ESDO guidelines,16 patients with poor liver synthetic function and tumour extent within the Milan criteria should not be denied the possibility of LT and are therefore not classified as terminal stage. According to APASL guidelines, LT provides the best curative treatment within Milan criteria associated with Child C cirrhosis and without radiological evidence of venous invasion or distant metastasis. In Japan, transplantation is recommended at this stage of cirrhosis for patients with HCC within Milan criteria and age ≤65, if disease control is not possible using other treatment methods. Tumour diameter, tumour number, tumour marker levels, extent of vascular invasion and degree of tumour differentiation are strong predictors of recurrence. According to the AIOM18 and German S3-guidelines,19 LT is the treatment of choice for patients with Child-Pugh C cirrhosis within the Milan criteria. For Child C cirrhosis, no LR is recommended according to the Italian guidelines. Figure 4 shows the comparison of the indications for LR and LT. Treatment of HCC in Child-Pugh C cirrhosis. Green circle: first-line therapy. Yellow circle: therapy can be carried out or therapy recommended as second line. Black circle: no or no clear treatment recommendations. Red-circled white dot: rejection of the therapy. HCC, hepatocellular carcinoma. 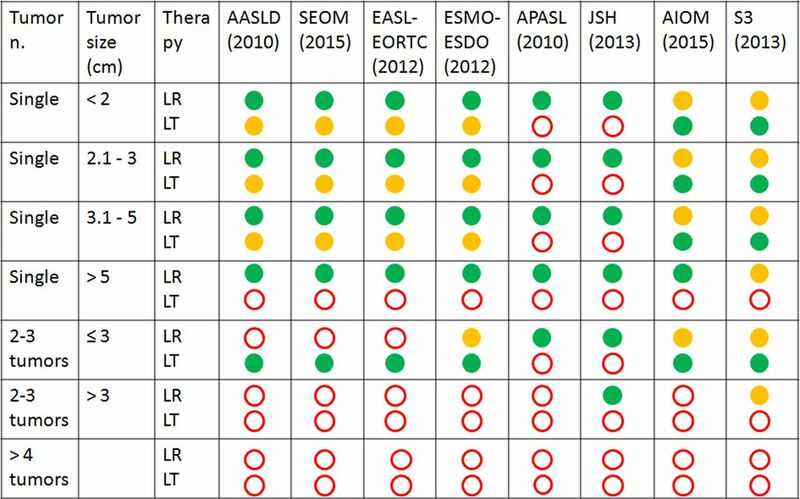 The AASLD guidelines,3 APASL,11 evidence-based Japanese guidelines and German19 do not recommend the expansion of the listing criteria beyond the standard Milan criteria. ESMO-ESDO guidelines16 give no statement in this regard. According to the SEOM guidelines,17 patients with tumour characteristics slightly beyond Milan criteria and without microvascular invasion may be considered for LT. However, this indication requires prospective validation. The EASL-EORTC guidelines15 state that the extension of tumour limit criteria for LT for HCC has not been established. Modest expansion of Milan criteria applying the ‘up-to-seven’ criteria (new Milan criteria: HCC with seven as the sum of the size of the largest tumour (in cm) and the number of tumours) proposed by Mazzaferro et al in 200936 in patients without microvascular invasion achieves competitive outcomes, and thus this indication requires prospective validation. In Italy, the expansion of the criteria was proposed, but the probability that a patient beyond Milan is transplanted is very low. LT for patients beyond Milan cannot be recommended according to the German S-3 guidelines. Generally, all guidelines recommend bridging therapy if the waiting list time exceeds 6 months. According to the ESMO-ESDO guidelines16 in case of a long-anticipated waiting time (>6 months), patients may be offered resection, local ablation or transarterial chemoembolisation in order to minimise the risk of tumour progression and to offer a ‘bridge’ to transplant. In Italy, bridging therapies are also allowed under progression while on waiting list. According to the German S3 guidelines,19 bridging is recommended when a long waiting time until transplantation is expected. According to the APASL guidelines,11 bridging therapy using local ablation or chemoembolisation may reduce the dropout rate with long waiting time of more than 6 months. According to the EASL-EORTC guidelines,15 patients already on the waiting list with tumour progression beyond Milan criteria and liver-only disease should be placed on hold until downstaging by local ablation or chemoembolisation is achieved and maintained for a period of at least 3 months. In the SEOM17 and JSH guidelines, no recommendation is given about bridging therapy for patients on waiting list. According to the SEOM guidelines,17 downstaging cannot be recommended. According to the EASL-EORTC guidelines,15 downstaging policies for HCCs exceeding conventional criteria cannot be recommended and should be explored in the context of prospective studies aimed at survival and disease progression end points. According to the APASL guidelines,11 downstaging therapy using local ablation or chemoembolisation may reduce the dropout rate with long waiting time of more than 6 months, but there is no proven benefit in long-term survival or downstaging to allow expanded indication. The Japanese evidence-based guidelines state that there is insufficient scientific evidence to support tumour downstaging prior to LT to improve HCC prognosis. The role of transplantation after downstaging is not established in Italy because of lack of high-quality evidence. On the basis of the available data, it is reasonable that patients slightly beyond Milan and in good general conditions can receive a consultation for possible transplantation. According to the German S3 guidelines,19 downstaging can be considered in order to achieve Milan criteria. AASLD3 and ESMO-ESDO16 offer no recommendation regarding downstaging. According to the AASLD guidelines,3 LDLT is a reasonable approach if the waiting time exceeds 7 months by taking into account the risk of dropout while waiting (4% per month), the expected survival of the recipient (70% at 5 years) and the risk for the donor (0.3–0.5% mortality).37 This procedure should be only performed by expert surgeons. According to the SEOM guidelines,17 patients within Milan criteria could be considered for LT from either a dead or living donor, achieving a 5-year overall survival of more than 70% and a 5-year recurrence rate of <10%.30 According to the EORTC-EASL guidelines,15 LDLT is an alternative option in patients with a waiting list exceeding 6–7 months. It is not recommended for any extended indications, except in the context of research studies, and should be restricted to centres of excellence in hepatic surgery. According to the APASL guidelines,11 LDLT is theoretically a more preferred choice for HCC patients, because the waiting list time is significantly reduced. However, risk of donor hepatectomy (0.3–0.5%) and recipient complications (20–40%) need to be considered in offering such treatment. LDLT is the main type of transplantation performed in Japan and does not involve wait list. In Italy, it represents only 0.6% of all transplantations. According to the German S3-guidelines,19 LDLT is an option for patients in whom a tumour progress is likely while on the waiting list with the risk of drop out. By using LDLT, waiting time can be avoided and thus tumour progression can be prevented. Additionally, it relieves the limited pool of deceased donor organs. As the potential risk of complications for the donor in experienced centres is relatively low, this possibility in absence of an appropriate postmortem donor and therefore a long-anticipated waiting time should be evaluated. Morbidity and mortality after LDLT is comparable with the recipient of a postmortem LT. 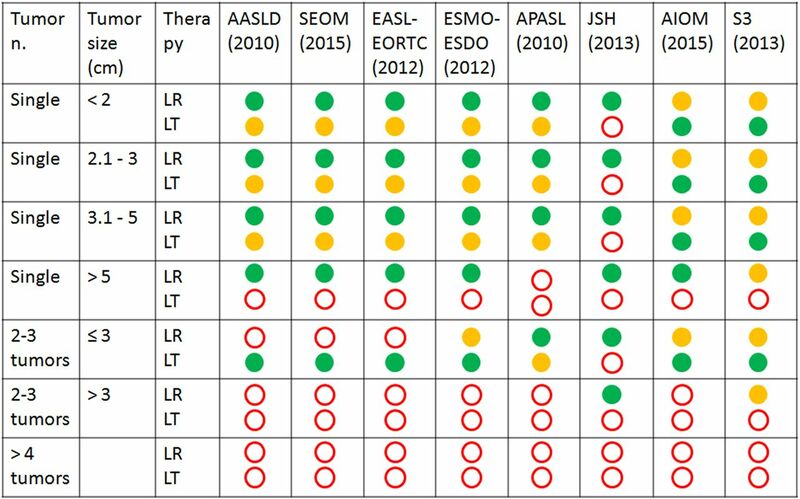 The guidelines ESMO-ESDO16 give no recommendation regarding live donor LT. Figure 5 shows the comparison of the recommendations regarding the expansion of the criteria beyond Milan, bridging therapy, downstaging and LDLT. Comparison of the recommendation regarding expansion of the criteria beyond Milan, bridging therapy, downstaging and LDLT. Green circle: first-line therapy. Yellow circle: therapy can be carried out or therapy recommended as second line. Black circle: no or no clear treatment recommendations. Red-circled white dot: rejection of the therapy. LDLT, living-donor liver transplantation. There is no worldwide consensus on the recommendation for surgical treatment of HCC, although the evidence is the same. Relative homogeneity in indications exists for the countries using the BCLC classification, with the exception of patients within Milan criteria and Child-Pugh C cirrhosis. These patients are classified as patients with end-stage disease according to the AASLD,3 SEOM17 and EASL-EORTC15 and therefore are consequently excluded from transplantation. Therapeutic-suggested option is best supportive care. The ESMO-ESDO guidelines16 allow transplantation for HCC within Milan on Child-Pugh C, and these patients are not classified as end stage. It is remarkable that the two European guidelines differ in a so important point, in one case excluding Child-Pugh C patients from transplantation (EASL-EORTC) and in the other allowing it (ESMO-ESDO). The Italian18 and German guidelines19 recommend transplantation for Child-Pugh C patients within Milan criteria. The question about the effective usefulness of European guidelines, when, for example, European countries like Germany and Italy use their national guidelines, remains open. Moreover, there is no homogeneity between European guidelines itself. Spain has also its own guidelines which are only accessible to members of the Spanish society of medical oncology. Another critical point where misunderstanding can arise is the treatment of single tumours between 2 and 5 cm in liver cirrhosis Child-Pugh A/B according to the EASL-EORTC and SEOM guidelines. In fact, both rely on the updated BCLC staging system (2011). As the original BCLC classification, on which the AASLD guidelines rely, clearly states that first-line treatment option is LR if no portal hypertension and elevated bilirubin are present and LT is indicated only in case of advanced liver dysfunction, the EASL-EORTC and SEOM guidelines are unclear in this point. While the text of the guidelines suggests treatment according to the original BCLC classification LR as first-line therapy, the graphical representation of the treatment algorithm in both guidelines suggests first-line therapy for such tumours is transplantation and not resection. Taking into consideration the graphical representation of patients with early stage disease (BCLC A) that they are not candidate for LR, we interpreted the guidelines according to the text and not according to the figure. However, this possible double interpretation needs to be mentioned and future guidelines should state without ambiguity the therapeutic strategy for these tumours. The major difference between the treatment algorithm used in Japan and the BCLC system is the indication for hepatectomy for HCC with ≤3 lesions and a diameter ≤3 cm on Child-Pugh A/B. The BCLC system recommends LT or RFA for HCC with two or three nodules and a diameter ≤3 cm. In contrast, the treatment algorithm in Japan recommends hepatectomy for HCC with ≤3 lesions if liver function is good, regardless of the tumour size. According to the Japanese guidelines, as well as for Italy, Germany and European ESMO-ESDO guidelines, first-line therapy for patients with Child-Pugh C cirrhosis and HCC within Milan criteria is transplantation. In Japan, the majority of transplantations are LDLT, whereas in Italy, only 0.6% of the patients treated with transplantation are LDLT. In general, cultural attitudes in Asia regarding life, death, ethics and religion have influenced their attitude towards organ transplantation from deceased donors greatly. The treatment algorithm of Japanese evidence-based guidelines includes grade of liver damage, tumour number and tumour diameter. Extrahepatic disease and vascular spread are not included in the algorithm in contrast with the AASLD and the APASL guidelines. This was explained by the need to keep the treatment algorithm simple, few evidences available to recommend a certain treatment option for HCC with vascular invasion and extrahepatic HCC at the time of initial diagnosis was considered rare in daily practice in Japan.13 Interestingly, extrahepatic spread and vascular invasion are included in the treatment algorithm of the consensus-based Japanese guidelines,14 whereas neoplastic invasion of bile ducts plays no role in all guidelines so far. Interestingly, only in the evidence-based Japanese guidelines an age limit of ≤65 is set to be transplantable. In several countries, as Germany or Italy, for example, no patients >65 yrs are routinely transplanted although no age limit is expressed in the respective guidelines. Quantitative liver function tests allow a more precise assessment of postoperative morbidity and mortality. The relevance of quantitative liver function tests has so far found consideration only in the guidelines of the JSH. In the JSH-HCC guidelines, the indocyanine green (ICG) test as an indicator of liver function is considered indispensable for surgical decision-making, but is not routinely performed before non-surgical treatments like RFA or Trans-Arterial Chemo-Embolization (TACE). As several publications demonstrate the usefulness of ICG clearance alone43 or in combination with other parameters44 or imaging-based liver function tests45 as a predictor of postoperative death, extended liver surgery has been made safer to avoid postoperative liver failure. Additionally to the ICG clearance, the LiMAx test has been found to be valuable to quantify liver function.46 Perioperative morbidity and mortality was reduced after implementing LiMAx algorithms in LRs,47 and after LT the LiMAx score was predictive for postoperative liver failure. However, so far LiMAx has not been recognised in any of the guidelines for treatment of HCC or LT. Also, new innovations in liver surgery like portal vein embolisation,48 two-stage hepatectomy,49 Associating Liver Partition and Portal Vein Ligation for Staged Hepatectomy (ALPPS)50 or partial ALPPS51 allow extensive LR with acceptable morbidity and mortality, even when transplantation because of tumour load is no option anymore. However, extended LR can only be performed in healthy liver, thus again leaving transplantation as only potential curative treatment. Another critical point which is not addressed in any of the guidelines is the tumour biology. Tumour biology, immunological and genetic tumour-specific treatments gain more and more impact on diagnosis, interdisciplinary treatment and outcome. One promising field regarding risk of acute rejection after LT is gene expression profiling. Thude et al52 demonstrated that genotyping of liver recipients for specific genetic polymorphisms might be useful to stratify liver transplant recipients according to the risk of acute liver transplant rejection. Mazzaferro,53 who introduced the Milan criteria in the field of LT, recently published an article about an adaptive approach for selection and allocation in LT for HCC. He proposes to maximise ‘all tumour and therapy heterogeneities in a model that utilizes variations in HCC presentation and response to treatment as adjusting factors to reconcile selection and allocation logistics, with the ultimate aim of increasing the benefit, effectiveness, and justice of transplantation for cancer’. Unfortunately, as stated before, not one actual guideline considers these important developments in individualised and specific treatment. In conclusion, whereas we find a consensus in HCC treatment in healthy livers, the analysed international recommendations about the treatment of HCC in cirrhotic livers show several variations, although nearly all guidelines claim to be evidence based. Moreover, promising prognostic factors considering tumour biology as well as liver function tests should be included in future guidelines. One possible explanation for the inhomogeneity among the guidelines included in our analysis might be cultural difference as well as variation in the healthcare system. Progress in the development of guidelines will be made when the reasons that explain the differences in the existing guidelines can be identified. These reasons can be identified when the burden and risks that have to be accepted and the outcomes, that is, the achieved survival and quality of life, can be assessed.54 Meaningful assessments require two essential conditions. First, the conditions under which ‘costs’ and ‘consequences’ are compared have to reflect the situation of day-to-day clinical practice and second, the conditions have to be standardised. The traditional method for comparative assessments of clinical outcomes is the randomised controlled trial. These trials measure effects under ideal study conditions, that is, efficacy, but not effects that can be detected under real-world conditions, which is effectiveness. Traditional guidelines are based on efficacy but not yet effectiveness data. Methods that compare effectiveness under real-world conditions have only recently been proposed.55 Some of these methods include risk stratification which means that only patients with similar risks (high, low or intermediate) can be compared and the baseline risks of each patient have to be related to each of the outcomes that will be assessed. These assessments under real-life conditions can be completed in any community hospital and will be important as basis of clinical guidelines. When outcomes, conditions, patient characteristics and interventions are described transparently, it will be possible to discuss possible reasons for different guidelines in different countries.
. Results of surgical and nonsurgical treatment for small-sized hepatocellular carcinomas: a retrospective and nationwide survey in Japan. The Liver Cancer Study Group of Japan. Hepatology 2000;32:1224–9.
. Surgical resection of hepatocellular carcinoma in cirrhotic patients: prognostic value of preoperative portal pressure. Gastroenterology 1996;111:1018–22.
. Practice guidelines committee, American Association for the Study of Liver Diseases. Management of hepatocellular carcinoma. Hepatology 2005;42:1208–36.
. Clinical guidelines SEOM: hepatocellular carcinoma. Clin Transl Oncol 2015;17:988–95. Associazione Italiana Oncologia Medica (AIOM). Linee Guida epatocarcinoma. Edizione, 2015. Deutsche Gesellschaft für Verdauungs- und Stoffwechselkrankheiten. Diagnostik und Therapie des hepatozellulären Karzinoms. Version 1.0. Mai 2013.
. NCCN clinical practice guidelines in oncology: hepatobiliary cancers. J Natl Compr Canc Netw 2009;7:350–91.
. Optimizing health—improving the value of healthcare delivery. New York: Springer, 2006:313. ISBN 0-387-33920-5. Contributors FP and DH-B contributed substantially to the conception and design of the study. GM and MK contributed in the analysis and interpretation of the data. GM and MK drafted the article. All authors gave the final approval of the version to be published.